SalesPad is increasing the software development company’s workforce to meet thriving business needs and growing product demand with a planned $3.85 million expansion adding 91 jobs. The company is doing so thanks to a $364,000 Michigan Strategic Fund grant from Michigan Economic Development Corporation secured with help from West Michigan economic development agency The Right Place, Inc. In order to grow, we really need tech talent. We honestly believe in the people, work ethic, and resources found in West Michigan. We’re committed to expanding and doing things right here in Grand Rapids. SalesPad, LLC, is expanding with a $3.85 million investment and 91 new jobs for the Grand Rapids-based company. The announcement comes with approval of a $364,000 Michigan Strategic Fund performance-based grant. The funding through Michigan Economic Development Corporation was secured with help from The Right Place, Inc., a Grand Rapids-based West Michigan regional economic development organization. The expansion is being done to keep pace with product demand and the need to expand its workforce from its current 110 employees, SalesPad’s co-owners said. 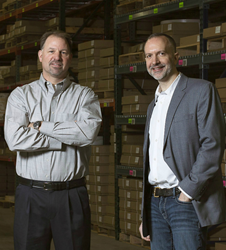 Founded in 2003 by Eardley and Williams, SalesPad is a Grand Rapids-grown software development firm. The company focuses on increasing business productivity and efficiency with enterprise software products that work with leading applications like Microsoft Dynamics GP and Intuit QuickBooks. In addition, SalesPad also creates customized software solutions for small and medium-sized businesses. West Michigan's information technology industry continues to be one of the fastest growing clusters in the nation, growing at rate of 13.8 percent, 9.4 percent higher than the U.S. national average, according to Economic Modeling Specialists International. The 13-county region is home to more than 14,000 technology professionals, from custom app and web developers to IT systems and security analysts, according to The Right Place.